Heading backstage at Erin Fetherston was both a total thrill and a total surprise! I was quite excited when Alisha Rimando of Dashing Diva was able to snag a pass for me at the last minute. I've been dying to get backstage at Erin Fetherston for years, as she's one of my favorite designers, so this was a definite highlight of the week. Find out everything I learned -- and it was a lot! -- after the jump. Right out of the gate, I chatted with one of the most expressive and exciting hairstylists I've come across, the fabulous Lyndell Mansfield. She's been working with Erin for four years, and she graced me with the fabulous story of how they met before getting down to business of telling us about the look for the show. "We actually met at a party during Fashion Week in Paris before Erin was actually showing," Lyndell said. "We saw each other across a room and it was love at first sight! We were bleach blond girls ... we’re both like, ah! She’s got good bleach! I was like, look how amazingly straight her hair is! [And she was like], look how curly her hair is! She had her own dresses, she was doing couture pieces, oneoffs. And she had this dress, she literally could have been Cinderella. She was backlit ... she was this blond in this fairytale dress, and I was like, oh my god, she’s a fairy! I was like this naughty punk fairy on the other side of the room and she was the good fairy!" How could you not love her, right? So after finding out about their fabulous friendship, Lyndell told me about the look for the show. "This girl is a little bit dark," she said. "Erin is normally light and fluffy, it’s a little bit darker than normal. It’s still a fairy tale girl but it’s more of a wicked fairytale, and she’s like the naughty character." To create a hairstyle that went with this darker feel, Lyndell thought of cartoons with curly or frizzy hair that's drawn in zig-zags. "It was about creating a texture that was almost an illustrative, animated kind of texture," she said. "It would be so cute if they look like that but they’ve got little bobs that are zig-zaggy!" Lyndell accomplished this by creating bobs with crimped sections. "We didn’t want to crimp all the hair because I think when you crimp all the hair it’s not really friendly to the people at home that want to do it," she said. She backcombed the entire head before using a bit of Bumble and bumble Does it All to seal it. 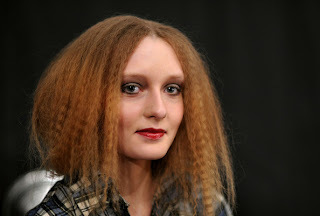 She then took specific sections and crimped them using a flat iron before brushing it out, which created a lot of fluffiness without the frizz. 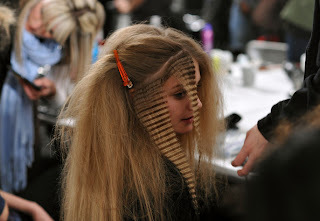 "All you need to do is the hairline and the part line with the crimper," she said. "So although you get the illusion once it’s put it up in the little bob shape that it’s all crimped, it’s very quick and easy. Girls can do it at home!" Creating the bob was very easy as well. Lyndell grabbed the hair as though it was going into a low ponytail, rolled it under and slid in a couple of long curvy grip pins to hold it in place. She then brushed the hairline so that it would be light and fluffy and move around when the girls walked down the runway, and finished with Bumble and bumble Shine Spray to add glossiness. "It still becomes soft, but she’s still got a little wicked side to her," Lyndell told me. "The shine on stage will make it look really reflective and that will be pretty!" Then it was on to makeup with Sebastian Tardiff of Bobbi Brown. It was the "tin soldier meeting the jewel box ballerina," he told me. "It's all contrast. We have the soft and the delicate with the solid and bolder." To make this look happen, Sebastian created a very glossy toffee apple lip using Crimson Metallic Lipstick, and a defined eye with Smoky Eyes and Charcoal Haze eyeshadows blended all the way to the brows. "We wanted a very beautiful, dreamy, open-looking eye," he said. He also used a new mascara coming out from Bobbi Brown this fall. Skin had a satin finish -- "The girls are going to look on stage like they have flawless, beautiful, smooth skin," he said. Alisha Rimando and her team from Dashing Diva were on hand to apply the nail color. They used Jet-Set, a dark burgundy frost that's one of the new polishes from Dashing Diva's Manhattan Collection.